The saga of the Phoenix Coyotes may finally be coming to an end. Gary Bettman and the leadership of the NHL, which has inexplicably fought to keep the Coyotes in the desert, may have finally reached the end of their rope. It has been widely reported that if the potential buyer for the Coyotes who actually wants to keep the Yotes in Arizona - Renaissance Sports and Entertainment - can not come to an agreement with the city of Glendale on how much they will be paid (yes how much the city of Glendale will pay the owners of the Coyotes) to operate the Jobbing.com Arena, the NHL will sell the team to an ownership group that will move the team to Seattle. Earlier this year, I wrote a lengthy piece laying out the case why the Coyotes should be moved to Quebec City. In the piece I admitted that while I believe strongly that Quebec City should be the destination for the Coyotes - I also believed that the NHL wouldn't move them there. If the Coyotes end up in Seattle, an all but done deal if the Glendale agreement can not be reached, that does not mean the end of the story for hockey returning to Quebec City - or for several other locations. The dirty little not so secret is that the NHL wants to put a team in Quebec City, as they should, and that they want to put a second team in the Greater Toronto Area, as they should as well, but the path they are going to choose to do this by is the wrong one, namely: expansion. No one in their right mind should be even considering expansion. According to Forbes estimations, a full 13 of the current 30 NHL teams LOST money in 2012. That's right, more than 1/3 of the current franchises are LOSING money. Indeed, one of the largest single motivating factors behind the lockout that cost us almost half of this season was the lack of financial viability for so many NHL teams. Why on God's earth would the NHL consider expanding when more than 1/3 of its franchises are losing money? Why on God's earth would anyone want to buy an expansion NHL franchise when almost all of the teams on the list of the biggest money losers are from the most recent wave of expansion? As with everything else in professional sports, the answer is simple: greed. Greed by the owners and greed by the players. While expansion in the past has been a gamble (and a poor one at that), this round of expansion is as close as it gets to a sure thing. The NHL isn't talking about putting expansion teams in non-traditional markets, no they are talking about putting expansion teams into cities like Quebec City and Toronto that are hot beds for hockey. Where hockey, above all other sports, is king. 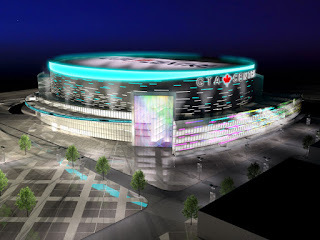 The cost for buying into this sure thing will be steep, the NHL owners will demand a king's ransom in expansion fees from any potential buyer of expansion franchises in Quebec City or Toronto. Some have said that expansion fees could reach upwards of $400- $500 million for each franchise (significantly higher than the $80 million paid by both the Wild and the Blue Jackets in 2000). A second franchise in the Greater Toronto Area would also require the consent of the Maple Leafs, who would have to be paid to grant such consent. Don't expect that will come cheap either. All of this revenue passes directly into the pocket of the owners because it is NOT part of the much talked about hockey related revenue (HRR) that must be shared with the players. Despite the NHLPA's desire to have expansion fees become a part of the HRR, Bettman and the owners won out in the last CBA and kept expansion fees all to themselves (another reason for expansion sooner rather than later is that owners want expansion BEFORE the expiration of this current CBA). Of course, the owners are the only ones who want expansion - so do the players. It has been estimated that franchises in Toronto and Quebec City would add an additional $80-$100 million per year to HRR. Not only will new franchises mean more money for players and owners, it will also mean more jobs for players. Putting a franchise in Quebec City and a second franchise in the Greater Toronto Area DOES make sense, doing it through expansion doesn't. Instead of looking to expand to 32 teams, the NHL should be looking to shore up or contract the 1/3 of the franchises in the league that lose money. By relocating perennial money losers like the Florida Panthers and the Tampa Bay Lightning to Quebec City and the GTA, the NHL could kill two birds with one stone and make the league more viable long-term. Of course, re-location fees are much cheaper than expansion fees, indeed the Jets ownership paid just $60 million to relocate the failed Atlanta franchise to Winnipeg. Franchises in Quebec City and the Greater Toronto Area make sense for the long-term viability of the sport, doing so through expansion, however, does not. At some point, the NHL must deal with the reality of the failure of hockey in some of these non-traditional markets.